Arctic Winter Games comes to the Bear Gallery! 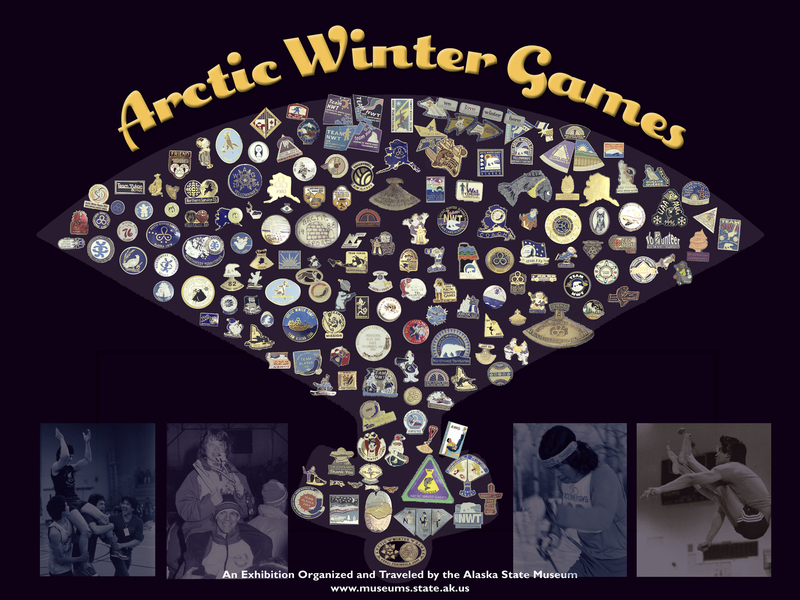 This March, we welcome the “Arctic Winter Games” traveling exhibit from the Juneau State Museum to the Fairbanks Arts Association’s Bear Gallery (3rd Floor of AK Centennial Center in Pioneer Park 2300 Airport Way). Don’t miss this unique opportunity to learn about the history of the games through cultural and historical items. The highlight of the exhibit is a comprehensive collection of Arctic Winter Games commemorative pins. The “Arctic Winter Games” exhibit is on display through Saturday, March 29, 2014. The Arctic Winter Games are staged every two years in either Alaska or Canada, although the 2002 games were split between Canada (Nunavut) and Greenland. Northern cities compete with each other for the privilege of hosting the Games, much like the Olympic Games host cities. Athletic contingents come from Alaska, Canada’s northern provinces and territories, Greenland, Russia and the Sami area of northern Scandinavia. Close to 2,000 athletes, performers and support crews now participate in the Games, with many more spectators traveling to the events. The Arctic Winter Games are probably best known for their Inuit and Dene games, those native to Eskimo and Athabascan cultures. However, they also include more widely-known sports, such as skiing, basketball, snowshoeing, volleyball and skating. Cultural exchange is a major feature of the games. Performing arts groups and musicians play a big role in the festivities. Winning athletes are awarded medals: gold silver and bronze ulus (an Eskimo cutting tool). The major award, however, is the Hodgson trophy, which is given for team sportsmanship. During their leisure time, many of the participants actively engage in pin trading, which is known as the “twenty-first sport” of the Games. George V. Smith, guest curator for the exhibit, began collecting lapel pins from the Arctic Winter Games (AWG) in 1992. The collection is nearly complete and totals almost 1,000 pins. Smith’s efforts led to the development of an exhibition on the history and organization of the Arctic Winter Games which will open at the Fairbanks Arts Association’s Bear Gallery March 7, 2014 to coincide with Fairbank’s hosting of the Arctic Winter Games. The exhibit describes the evolution of the Games, the sports, awards and cultural activities, as well as the Games’ organizational structure. In addition to the collection of AWG-related pins, the show features photo panels, jackets, team clothing, sports equipment, emblems, mascots and other paraphernalia. Smith has also written a catalog to accompany the exhibit describing the Games and their history. Smith now works at the Institute of Museum and Library Services in Washington, D.C., he was previously Deputy Director and Acting Director of the Alaska State Division of Libraries, Archives and Museums and a long-time resident of Juneau. He served on the AWG Team Alaska staff for three Games and then became a board director for Team Alaska. For more information please visit https://fairbanksarts.org/ or contact 456-6485 ext 222.